The Fuji T-1 was Japan's first jet-powered trainer aircraft. The first flight was in January 1958. A total of 66 T-1 planes were built. It was retired in March 2006. The T-1 was the first indigenously designed Japanese jet aircraft to be developed since World War II. 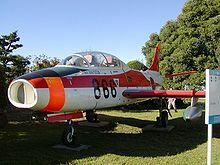 Although a new-design aircraft, it was modeled on the F-86 Sabre airframe. The T-1A was powered by the British-designed Bristol Siddeley Orpheus turbojet, while the T-1B used the Ishikawajima-Harima J3 turbojet. Fuji T-1s are on display outside the Subaru plant in Ōta, Gunma and at the Tokorozawa Aviation Museum in Tokorozawa, Saitama. T-1A : The T-1A is powered by a 17.79 kN (4,000 lbf) Bristol Siddeley Orpheus Mk 805 turbojet engine. The original designation was T1F2. T-1B : The T-1B is powered by a 11.77 kN (2,646 lbf) Ishikawajima-Harima J3-7B turbojet engine. Donald, David and Jon Lake. Encyclopedia of World Military Aircraft. London:Aerospace Publishing, 1996, Single Volume Edition. ISBN 1 874023 95 6. Taylor, John W. R. Jane's All The World's Aircraft 1965-66. London:Sampson Low, Marston, 1965.